After a long, hard & tiring day, bedroom is the place where one wants to crawl in and rejuvenate one’s spirit and energy. Cozy bedrooms give inspiration to one’s soul to refresh, relax and give more scope for innovation. Vibrant bedroom patterns soothe heart, spice up relations and offer peace to heart making it a niche for personal retreat. Depending on one’s taste & style, bedrooms can range from lavish to rusty, classic to contemporary and bright to exotic models. While some prefer bedrooms only as a place to rest and recharge, others use it as a living room or a place to sit, watch or read. 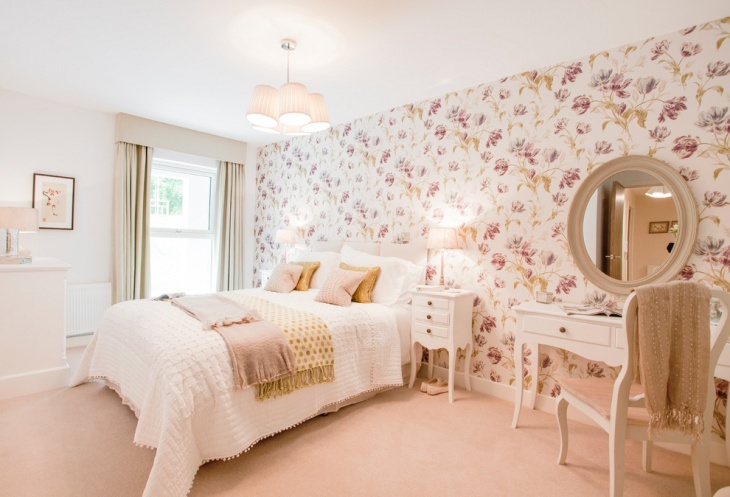 There’s no specific definition for a perfect bedroom, at last personal taste is what matters in sprucing up the bedroom. Here are few ideas/patterns of modern bedrooms. When it comes to contemporary bedrooms, the alternatives are infinite. This contemporary style depicts a fresh, clean & lavish ambiance with great view of landscapes, smooth flow of crisp air, different floral arrangements with a pinch of greenery and a tinge of woody and rusty patterns inviting both natural and artificial light. Women adore pink. They like to decorate their bedroom with all colors possible to make it look lively and lovely. Feminine bedrooms exemplify softness and elegance. Rich colored shades, floral patterns, pastel backdrops and soft & calm ambiance depict a woman’s character. Such bedrooms are warm and inviting and are very soothing to the vision. White painted walls and flooring with soft accessories and interiors, pops of flower arrangements, little naughty wall hangings, and a wide-spaced wardrobe can make a girl’s room brighter and colorful. This can add life to the room and can be the girl’s favorite to win over her heart. Masculine space is all about light and dull hues, dark and gray shades, no-showy accessories, minimal interiors, classic wall decors, compact yet luxurious style. To subsume, guys like it simple. Classic style with plain wallpapers, cinch of warm shades, vintage patterns, distinct wardrobes, and monochrome accents can be chosen to be more fashionable and to surround ourselves with fragments of life. Serene color themes with unique pairing of fabric and furniture, soft accents, classic chandelier can make any place look elegant and aesthetic. Scheme of gold or white, beige or blue and sophisticated palette with a blend of lights at all corners of room give restful mood. A glass-topped table with a sofa piped in gold or blue and a fire place in the middle of a wall can transform the place into serenity adding beauty to the room. Have you ever dreamt of waking up looking at the turquoise sea with waves touching the sky, crashing against rocky beach and falling back to place? It will make you happy, peaceful and as serene as sea. Isn’t it? Have a picturesque view of aquamarine sea, lucid blue skies; hear to the naughty sounds of the waves thrashing against the gold-edged shore, and let the cool & crisp breeze kiss your cheeks. 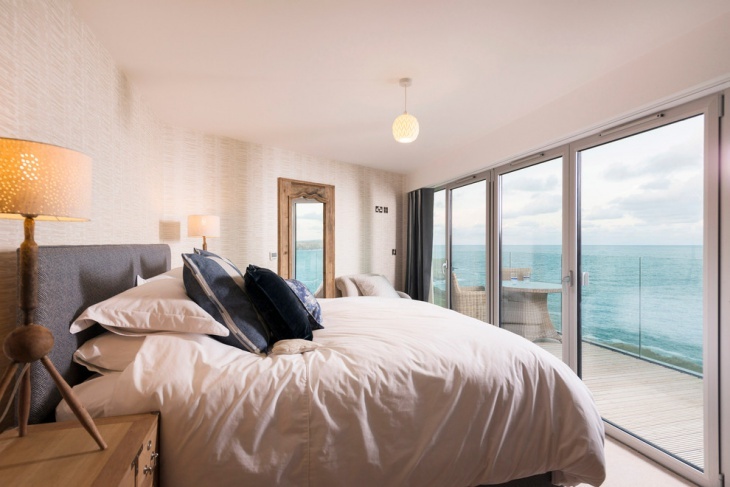 The sea-view bedrooms decorated with bold coral prints, tickling blue murals, oyster embellished mirrors and white wardrobes give scope to have a panoramic view of the sun, sand & sea. Old-modeled windows, sea-foam furnishing and vintage patterns enhance the coastal vibe. Giving a pastel look with a mix of eclectic accents, flowing draperies, warm lighting, exotic wallpapers, and touch ups of fiery red can make your bedroom romantic, warm and seductive.